Titan Poker offers a number of excellent promotions for its players, alongside their VIP program, tournaments with GTD prizepools and a regular freeroll schedule. There are promotions for new players and for the seasoned veterans alike. Some run only at certain times of year – also check our up to date promotions feed. Sign-up Bonus – New players receive a 200% bonus of up to €1,500 equal to a 25% rakeback equivalent. 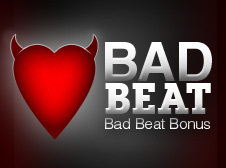 Bad Beat Bonus – Love with quad kings or worse and collect $250 to ease the pain a bit. Beginners Races – New players compete for $6,000 in raked hands races exclusively for new players. Double Challenge – Finish high in two tournaments on the same day and take down the progressive jackpot of at least $1,000.